Tag line: "27 banks in three years - anything to catch the perfect wave!" I’m sure I’m not the first person to call 1991’s Point Break an adrenaline rush, but that’s exactly what this movie is. On second thought, I take that back: a well-paced thriller with a top-notch cast and a dozen or so great action scenes, Point Break is not just an adrenaline rush… it’s the adrenaline rush. Rookie FBI agent Johnny Utah (Keanu Reeves) has been assigned to the Bureau’s Los Angeles branch, where he’s teamed with seasoned veteran Angelo Pappas (Gary Busey). Their first case as partners is to track down a gang of bank robbers known as the “Ex-Presidents” (because they wear masks of former US presidents Ronald Reagan, Richard Nixon, Jimmy Carter and Lyndon B. Johnson). Over the past 3 years, the Ex-Presidents have ripped off two dozen or so L.A. banks, stealing only the money in the cash drawers and making sure they’re in and out in 90 seconds flat. Despite having very few clues to go on, Agent Pappas believes the crooks are surfers, and are using their ill-gotten gains to keep them afloat during the summer months (every robbery has thus far occurred between June and October). Against the better judgment of his direct superior, Agent Ben Harp (John C. McGinley), Johnny goes undercover, posing as a wannabe surfer, in the hopes it will help he and Pappas figure out the identities of each of the “Ex-Presidents”. 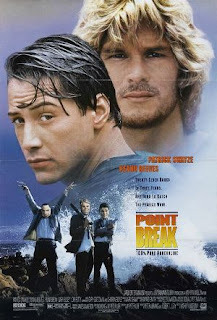 After coaxing Tyler Endicott (Lori Petty) to give him surf lessons, Johnny is introduced to Bodhi (Patrick Swayze), a surfer / amateur philosopher who, along with his friends (James LeGros, John Philbin, Bojesse Christopher), enjoys living life on the edge, doing everything from surfing at night to skydiving. For Bodhi, surfing is more than a sport: it’s a religion, and before long Johnny finds himself admiring his new buddy’s outlook on life. But when all signs point to the fact that Bodhi and his gang are the bank robbers he’s looking for, Johnny must decide where his loyalties lie: with the Bureau, or with his friends. Director Kathryn Bigelow keeps the thrills coming fast and furious, loading Point Break with a number of electrifying sequences. The surfing footage, much of which plays out in slow-motion, is plenty intense on its own, but in addition the film gives us everything from car chases and shoot-outs to extreme sports (one of my favorite sequences is when Bodhi and his pals introduce Johnny to skydiving). As shot by Bigelow, even the bank robbery scenes (most of which end as abruptly as they begin) are jam-packed with excitement. The cast is beyond superb. Gary Busey is at his manic best as Johnny’s oft-unhinged partner, and while Lori Petty may not look like a surfer (what with her slight frame and short black hair), she represents the ladies well, holding her own in what is an otherwise all-male production. As for the film’s lead characters, Keanu Reeves is spot-on as FBI Agent Johnny Utah, but it’s Patrick Swayze as Bodhi who steals the show. A complex individual, Bodhi is on a never-ending search for the ultimate thrill, yet at the same time is the film’s most spiritual character (while sitting around a beach campfire with his compatriots, Bodhi gets all philosophical, saying what they’re doing isn’t for the money, but “to show those guys that are inching their way on the freeways in their metal coffins that the human spirit is still alive”). As brave as he is intelligent, Swayze’s Bodhi is arguably one of the most likable villains in cinematic history, and we can’t help but root for him a little. I like Point Break a bit more each time I see it, and thanks in large part to the work of its great cast and crew, it ranks as one of the seminal action films of the 1990s. I've watched this several times and had a blast each time. I'll be watching the remake this weekend. Wish me luck. I absolutely love this film, and considering I do not typically like action flicks, that's saying something. I own the BluRay and periodically HAVE to get my Point Break fix. It gets played a lot. The remake? It was big, it was pretty, but it had no soul. None.